While this season might be a time for Christmas or Chanukah or Kwanzaa, it most definitely centers around the shopping solstice. In Beverly Hills three blocks of Rodeo Drive stretch north from Wilshire to (as locals call it) “Little Santa Monica.” It is along those blocks that shoppers can spend big amongst the glitterati of Los Angeles. This map dates back to 1995 in the flush years of the first Clinton presidency when gas was $1.09. The baubles you could purchase on these three golden blocks, though, might cost a month’s rent or a lot more. This map is one of a series created by the energetic Paul “Mister Maps” Shaffer, for which he took the format for old pictorial maps and turned it into something more. Rather than making the image solely about business establishments, he stressed the features of the landscape. Rodeo Drive (described by one hopeful credit card company as “the most elegant street in the world”) may be all about high end retail, but this map accentuates greenery as much as it does the dignified but undeniably ostentatious stores. The land that was once Rancho Rodeo de las Aguas was transformed in 1906 when Burton E. Green and investors bought it and put Rodeo Drive right down the middle. The investors had hoped for oil, but though the soil lacked petroleum, it proved profitable for agriculture and residential real estate. Beverly Hills may not have been immediately glamorous, but movie folks soon began filling those hills with mansions. The very posh Beverly Hills Hotel opened in 1912, standing majestically on Sunset Boulevard two years before the area was incorporated into Beverly Hills. Rodeo drive sat quietly at the center of the city for decades. That began to change in the ’50s. In 1949 Richard Carroll opened Carroll and Company—a shop offering high quality men’s suits and hats—in West L.A. He soon moved the store to Rodeo Drive, where, at the time, there was little more than a gas station and a hardware store. Before long, a shopping destination had developed that was the spot for the show business crowd. In 1967 Fred Hayman opened the Giorgio high fashion boutique with its trademark yellow and white striped awnings. Van Cleef & Arpels’ flagship American store soon opened, followed by Vidal Sasoon’s salon for the stars. The late ’70s success of Judith Krantz’ novel Scruples—which was set on Rodeo Drive—shone a brighter spotlight on the gilded street where golden plastic flashed relentlessly during all four seasons. 1983 brought the Rodeo Collection of 45 retail boutiques, and the street became internationally famous for offering the best of the best. 1989 saw “Two Rodeo Drive” unveiled, with shops like Lanvin, Versace, Jimmy Choo, and Tiffany & Co. that most Angelenos had only heard about on TV. Guess? 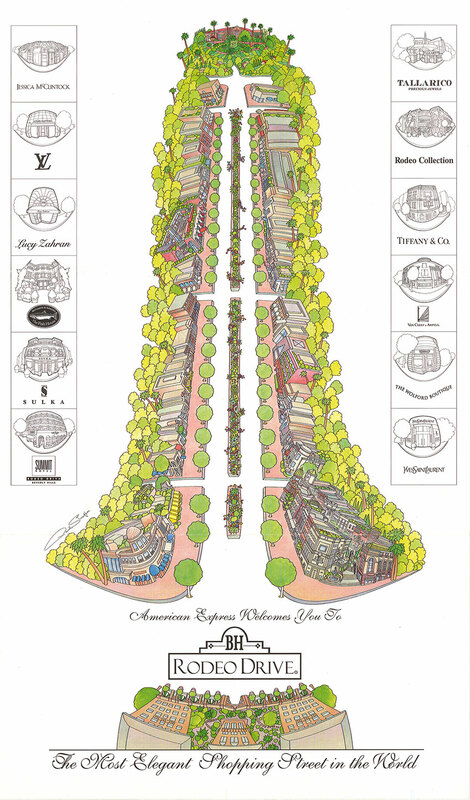 Ranch joined in 1993, and by the time this map was made, even more stores were singing their siren song, including Gucci, Louis Vuitton, Fendi, Hermes, and the excellent Rizzoli Bookstore, publishers of Los Angeles in Maps—which makes a fine Christmas present, if I do say so myself.